Rejoice my PC gaming brothers and sisters! 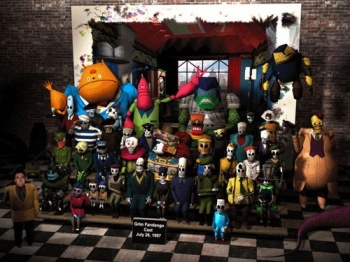 Grim Fandango is one of Lucas Art's more classic of classic PC adventure games, following the story of travel agent Manny Calavera in an epic film noir-style adventure. It was easily one of the defining titles of the PC adventure game genre, so you can understand both our excitement, and confusion, when a remake of the title was announced at E3... for the PlayStation 4 and PlayStation Vita. At the time, Tim Schafer teased that information for other platforms was coming soon, and now, Double Fine has announced that Grim Fandango Remastered will also be heading to the PC, Mac, and Linux platforms. "Reap your heart out!" said Double Fine on its official Twitter account. "We're pleased to announce Grim Fandango will also be available on PC, Mac, and Linux alongside PlayStation 4 and Vita!" This is some pretty fantastic news for Grim Fandango's dedicated PC fan base, but honestly, was there really any doubt that this one would be making its way to the platform it was born on?